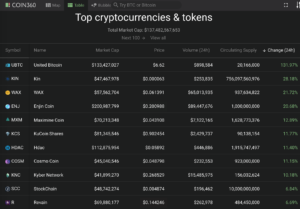 Over 2100% gain listed on NewDex.io is NOT a typo, but likely the result of thin order books–the larger cryptocurrency market has many of the smaller cap altcoins moving up once again. 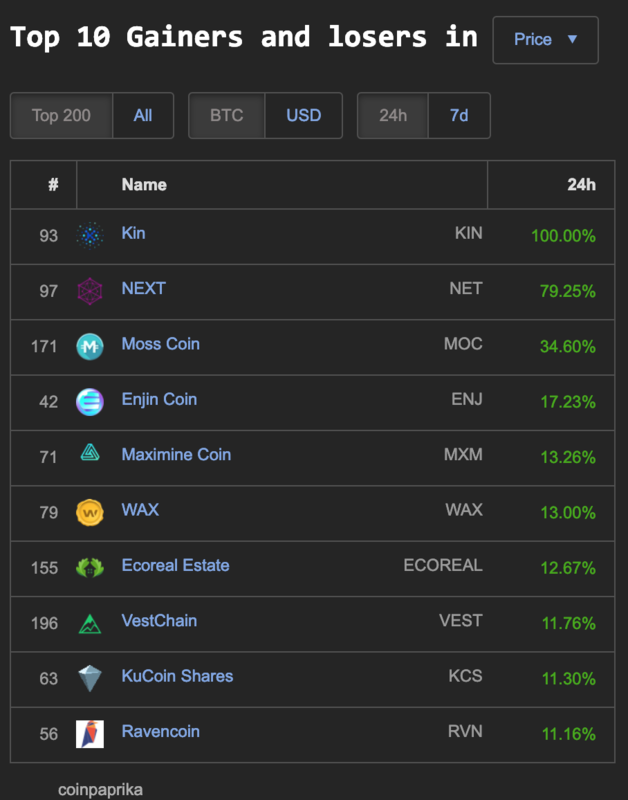 KIN 28%, WAX 21%, Enjin Coin (ENJ) 20%, Maximine Coin (MXM) 12%, KuCoin Shares (KCS) 11%, HDAC 11%, Cosmo Coin (COSM) 11% and Cyber Network (KNC) 10%. 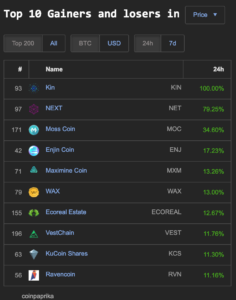 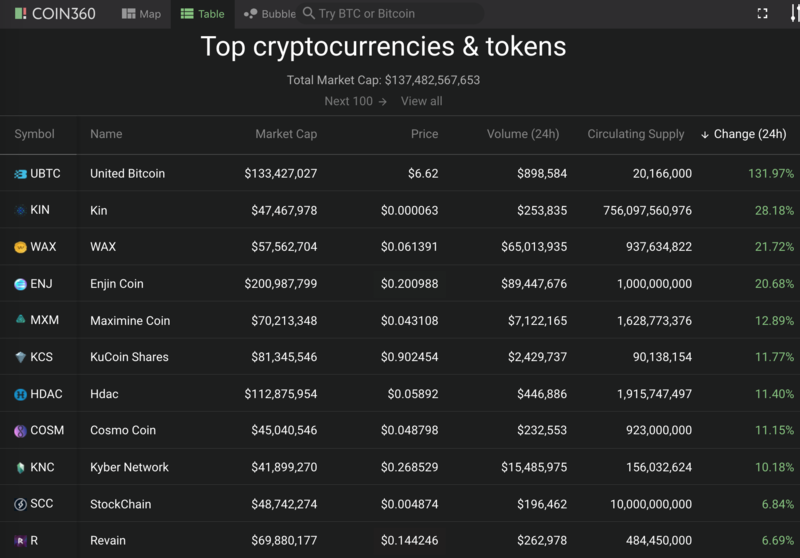 NEXT (NET) 79%, Moss Coin (MOC) 34%, Enjin Coin (ENJ) 17%, Maximine Coin (MXM) 13%, WAX 13%, Ecoreal Estate (ECOREAL) 12%, VestChain (VEST) 11%, KuCoin Shares (KCS) 11% and Ravencoin (RVN) 11%. 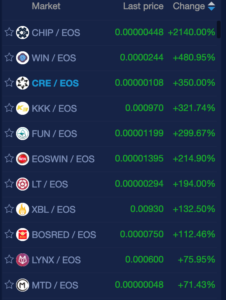 NewDex.io exchange has CHIP gaining 2140% (their website is even down at the moment) and has 8 coins gaining triple digits: WIN (480%), CRE (350%) KKK (321%), FUN (299%), EOSWIN (214%), LT (194%), XBL (132%), BOSRED (112%). 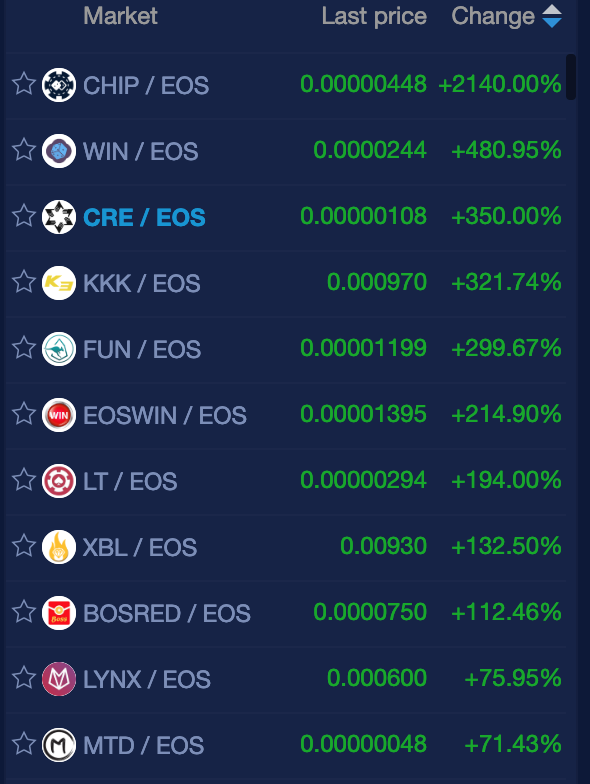 There are also nineteen other coins/tokens with double digit gains some non-gambling coins being: LYNX (75%), WRK (40%), PTI (38%), WIZZ (37%), PEOS (33%), BRM (22%), EDNA (19%), TEA (13%) HVT (10%), ECTT (10%).